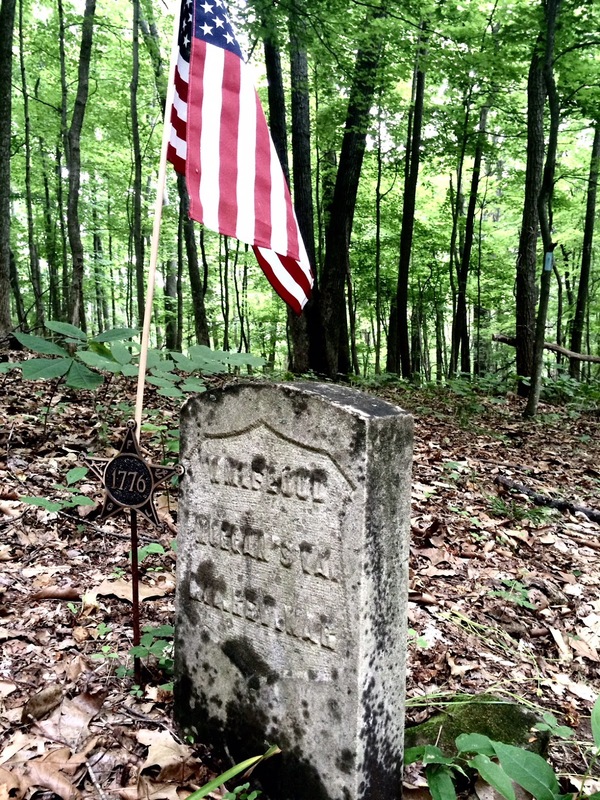 I overheard the trail crew talking about it: a grave site along the new trail. A Buckeye Trail work party was building a new hiking trail in June, 2015, through the Edge of Appalachia Preserve in Adams County, Ohio. 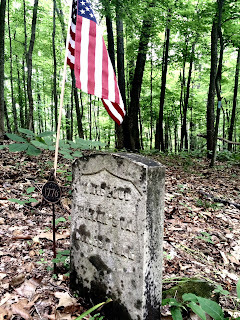 One day after trail work was done I hiked out to see the grave. Ted Cox, a volunteer tour guide at Campus Martius Museum, sent me some information he found on line about William Flood. I learned that Flood had been part of Daniel Morgan's Virginia Riflemen on Benedict Arnold's campaign to capture Quebec in late 1775. Instantly I made the connection: Flood was in the same campaign as two other prominent men with Marietta connections: Return Jonathan Meigs and Aaron Burr. What follows is a story of three remarkable men, very different in their backgrounds and stations in life, but united in their zeal for the Revolutionary cause. And each was heroic in their courage and perseverance during the Quebec campaign. Invading Canada was thought to make strategic sense. French speaking inhabitants were believed sympathetic to the American cause. It would deny the British a base for operations down the Hudson Valley. General Philip Schuyler was dispatched into Canada via Lake Champlain. George Washington approved a separate expedition led by Benedict Arnold to Quebec. This group would combine with Schuyler's force to take Quebec. 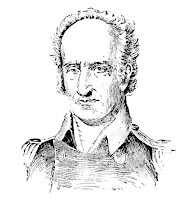 “I am now to inform the honorable congress that, encouraged by the repeated declarations of the Canadians and Indians, and urged by their requests, I have detached Col. (Benedict) Arnold, with one thousand men, to penetrate into Canada by way of the Kennebec River....I made all possible inquiry as to the distance, the safety of the route, and the danger of the season being too far advanced, but found nothing in either to deter me from proceeding..."
There was some political spin in the first sentence. The last sentence, though spoken honestly, would turn out to be tragically misleading. He also wrote a glowing letter to Canadian citizens inviting their cooperation which included this plea: "Come then, my brethren, unite with us in an indissoluble union; let us run together to the same goal." The Quebec expedition turned out to be grueling struggle which ultimately failed in its objective. Everything that could go wrong did. Boats provided for river transport were poorly made and leaked. The map of the route was inaccurate. The distance was estimated at 180 miles; it was actually twice that. The men - and many of their leaders - lacked proper training, conditioning, and discipline. Illness and exertion put many out of service. Service in Morgan's company required immense physical and mental stamina. To start, Morgan marched them 600 miles from Winchester to Boston in just 21 days. That is an average of 30 miles per day. On November 1, Morgan lost all of his boats in the rapids of the Chaudiere River along with their food, supplies, and the doctor’s medical kit. One of his men drowned; Morgan himself barely survived. The expedition forces crossed the St. Lawrence River undetected to Quebec City on the night of November 13. 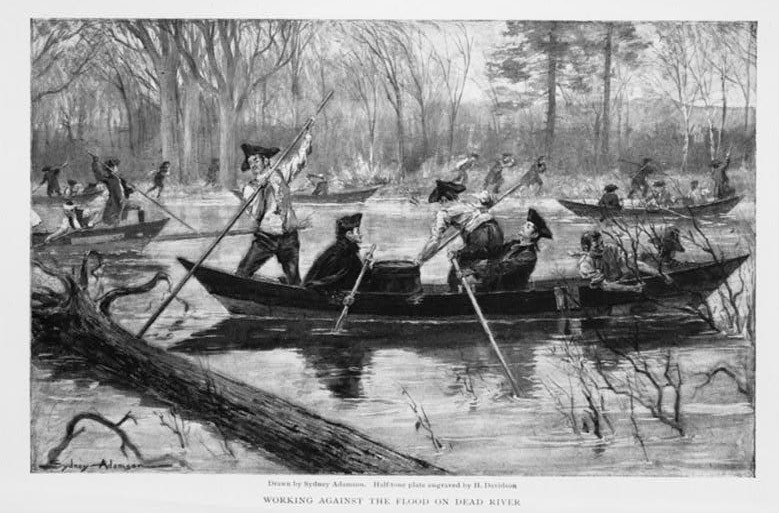 Morgan was in the lead canoe with expedition leader Benedict Arnold. Morgan boldly suggested attacking the city immediately with the element of surprise - even though some of their force had not crossed the river yet. Arnold thought about it but decided to wait. The attack was finally mounted on December 31 at 5 am in a blinding snow storm. There were two main attack groups: one lead by General Richard Montgomery and another led by Benedict Arnold. Daniel Morgan's unit was with Benedict Arnold. Morgan took command of that force when Arnold was wounded. His men pressed on, withstanding withering fire, to overcome blockades and enter the Lower City. Henry's journal: Morgan, "brave to temerity, stormed and raged,....though under tremendous fire." Montgomery's force withdrew after General Montgomery and senior officers were killed by a single cannon shot - ironically, a shot fired off by a drunken British sailor as he fled his station. With Montgomery’s force out of the fight, British troops were able to concentrate men and fire on Morgan's unit. By 10 that morning, they were surrounded and forced to surrender. William Flood was fully engaged in all of this dangerous action - and was taken captive along with Morgan's force. Captivity brought on new misery. Prisoners received only limited food, due in part to a general food shortage in Quebec. Some played games to kill the monotony. All Fours, a card game, was was a favorite for some - played not for money but for biscuits and other necessities. Poor nutrition afflicted the men. Diarrhea and scurvy became rampant. Scurvy caused weakness, severe joint pain, bruising in the legs, and mood swings. A doctor prescribed cleansing of the stomach with cathartics - and exercise. The men tried to stay active and often played Fives - a game similar to handball. The activity did temporarily ease the joint pain. Later in April, green plants - even grass, dandelion, and onion tops - helped relieve the scurvy. William Flood escaped from captivity in Quebec and returned to Staten Island. He re-enlisted in Morgan's Virginia Riflemen after the men had been returned in a prisoner exchange. He continued in Morgan's company until the end of the war - five long years after the Quebec campaign. After the war, he moved to Adams County, Ohio, perhaps on a land grant. 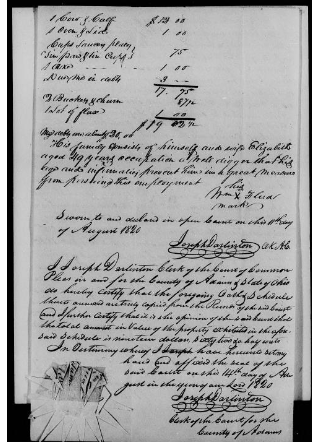 An affidavit required for his pension in 1818 poignantly states "...from unforeseen events I am in great need of aid to render me more comfortable in my old age." A similar affidavit in 1828 listed his occupation as well digger and that "his age (80) and infirmities prevent him in great measure from pursuing his employment." His meager statement of assets included "1 cow & calf $12.00, 1 oven and lid $1.00, Cups saucers tin pan and tin cups $.75, among a few others. His total assets were listed at $19.62 with debts of $20.00. He signed the affidavit "William hisXmark Flood." He was likely illiterate. William Flood - portion of affidavit required (to prevent fraudulent claims) after 1818 to continue pension payments. This part includes a list at top of document of his meager assets. Return Jonathan Meigs emerged from British captivity in early January, 1776. He had been captured with others in Morgan's forces. British Commander Guy Carleton allowed him to retrieve belongings of the officers at the Americans’ camp. He returned to his captors the same day. He had joined the Quebec expedition as a Major in September, 1775, from the 6th Connecticut Regiment. Find out how he acquired the name "Return" by clicking here. He kept a journal, writing in "ink" made of gun powder and water. Major Return Jonathan Meigs was given an early release from captivity in May of 1776 by General Carleton and returned home. He continued his service in the Continental Army with distinguished action at Sag Harbor, Stony Point, and in suppressing a mutiny. 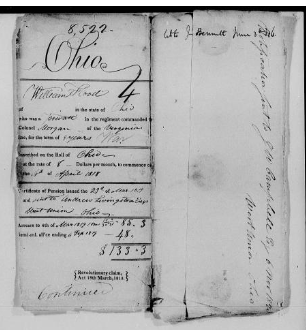 Meigs joined the Ohio Company of Associates as a surveyor and moved to the new settlement at Marietta in 1788. He served as a territorial judge, justice of the peace, and clerk of the Court of Quarter Sessions. In 1801, he went to Tennessee to serve as agent to the Cherokee Nation where he remained until his death in 1823. The battles at Lexington and Bunker Hill had electrified the thirteen colonies - and Aaron Burr, later a prominent lawyer, politician and Vice President of the United States. He was 19 at the time. One of his biographers noted that "this young student-at-law threw aside his books, and seized the sword, on fire to join the patriot forces." Burr was excited by the military life. He had studied it since childhood. His was a quick learner, natural leader, self promoter, fearless and steady under stress. Though slight in stature, he was able to endure intense physical exertion and privation. He joined the army at Cambridge MA near Boston. He leaped at the chance to join Benedict Arnold's campaign to capture Quebec. His family and friends tried to dissuade him but he was resolute. On the arduous trip to Quebec, Burr quickly gained the respect of his fellow soldiers for his bravery, willingness to help others, and wilderness skills. His biographer noted that "His hardihood and quick helpfulness attracted general admiration among the troops." He soon attracted the attention of senior officers. 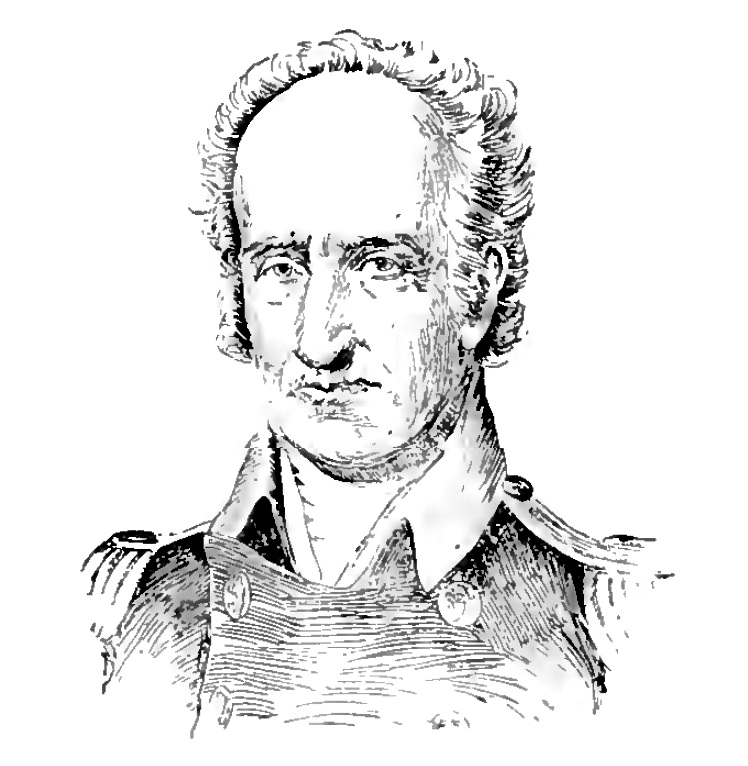 Benedict Arnold entrusted Burr to deliver a message to General Montgomery at Montreal. This required traveling alone across 128 miles of enemy territory. Burr gave a striking example of his tact and creativity by disguising himself as a priest, to gain more cooperation and minimize suspicion of the local population. His knowledge of Latin allowed him to elicit help of with a religious order to guide him along his route to General Montgomery. At Montreal, the latter was so impressed with Burr that he made him an aide-de-camp with the rank of Captain. He participated in discussions about planning the attack. Aaron Burr was at the front of the attack on Quebec with General Montgomery when the General and others were cut down by the cannon shot. The attack faltered. Burr stayed cool and was vehement in urging the attack to continue. Captain Richard Platt who commanded a company in the attack testified that Burr "animated the troops, and made many efforts to lead them on...and might have succeeded, but for the positive order of the commanding officer to retreat." Burr also braved heavy fire to attempt, unsuccessfully, the retrieval of General Montgomery's body from the snow. He stayed with the Arnold's diminished forces near Quebec for a time but disagreed vocally with Arnold's ideas and bearing. He left against Arnold's wishes, an act of insubordination which Arnold ultimately overlooked. Burr served on the staff of other Generals, including George Washington (with whom he developed a long standing feud) and Israel Putnam. His service was exemplary. For decades after, many would recall his performance during the War, particularly the Quebec campaign, in glowing terms. In 1779 he resigned due to poor health. He began the practice of law and entered politics. 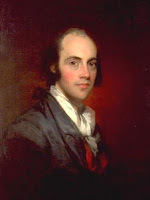 Some 25 years later, Aaron Burr began planning an expedition (often referred to as "The Burr Conspiracy") to the United States western territories. That brought him to Marietta through contacts with Harman Blennerhassett, Dudley Woodbridge, Joseph Barker, and others. For more detail, click here. Oct 3: (Meigs) In the evening....my battoe (boat) filled with water...I lost my kettle, butter, and sugar, a loss not to be replaced here. October 8 Henry:..a twig, perhaps, caught the buckle of my shoe: tripped , I came down head foremost, (down an incline) about 20 or 30 feet. October 11 Henry: ...we observed a great smoke before us, (hoping it would be a camp of fellow soldiers). ...at the great smoke there was no army, no friends, no food, only a friendly fire, kindled by ourselves...; it had been our camp as we ascended the river." Oct 13 Henry: ...we arrived at our first encamping ground on the Dead River...pallid and weak, for want of substantial food in due quantity." Oct 16 Henry: "Melancholy of the desperate kind oppressed me. (I feared) that we should die of mere debility in these wilds." Oct 22 Meigs: The river rose 8 ft overnight, flooding the area, impeding passage of those marching on land. Henry, John Joseph, Account of Arnold’s Campaign Against Quebec, Albany, Joel Munsell, 1877.